...so how do the rest of you of the TNFJ view this strategy? Do you have enough Helleberg mouthpieces to go around? They had you at "Free Shipping". 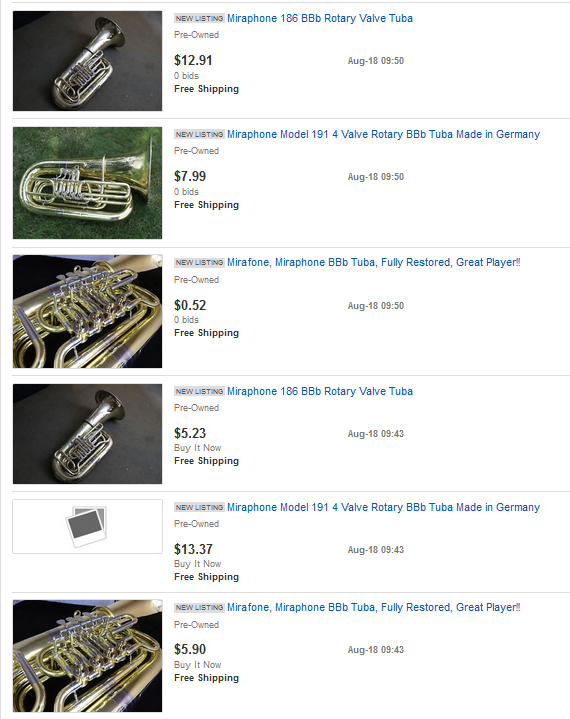 They are all rotary tubas . . . not my style. Although, I have to admit, the one for 52¢ seems like a very fair price. These horns pop up frequently on the bay. They're up for a short time until EBay removes them. I think they're all sketchy. Don't do it. Serial numbers, Joe. Serial numbers. I'd try to low ball them . If free shipping is to the international space station I would say it would be an out of this world deal. As a package deal, price is about right. The wonderful, free, online Random Advice Generator wrote: You have the right to let someone solve his/her own problems. Enjoy using the Random Advice Generator in all your future TubeNet posts. Very handy! I keep notifying fleaBay Central Command about these. They've become less frequent, but still pop-up. I'm amazed at the guy's choice of tuba players as his target market. hup_d_dup wrote: As a package deal, price is about right.